Linden New Art presents Dark Water, a new body of work by Perth-based artists Erin Coatesand Anna Nazzari. Exploring the ‘oceanic gothic’ with a twist of horror, the exhibition will open at Linden New Art on Saturday 4 May until Sunday 23 June. Dark Water will be displayed alongside a group show titled Elements by urban Aboriginal art centre, Baluk Arts. Dark Water includes a short film, shot almost entirely underwater, as well as works on paper, silicon and ceramic sculptures and scrimshaw (etched whale teeth). The short film presents a deep-sea environment that unexpectedly manifests in the walls of a grieving woman’s suburban dwelling. This darkly surreal work draws parallels with a sense of human loss and the impact of climate change on our oceans. 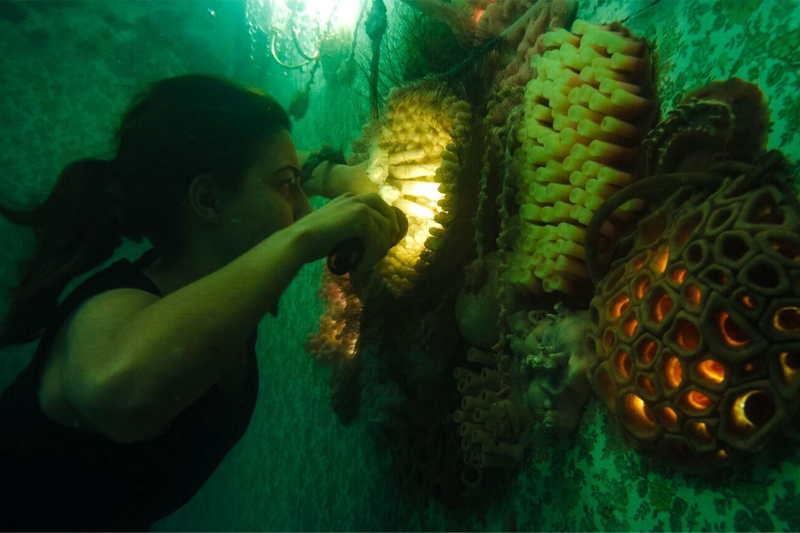 Dark Water draws on the artists’ research into marine flora and fauna and the experiences of deep-sea divers, to explore familial trauma and the dissolution of the human psyche in a strange waterlogged architectural space. “As female artists working in what may be loosely be described as the genre of horror, with a noticeable range of sub genres (Oceanic Gothic, otherworldly), the peculiarities of horror hold great appeal. While horror themes for some, can be misogynistic or objectify women, it allows us to challenge what is taboo, to explore questions about culture, race, sexuality, gender and the body,” said Coats and Nazzari. Erin Coates is a visual artist and creative producer working across film, sculptural installation and drawing. Coates’ practice examines our relationship with and within the spaces we build and inhabit, focusing on the limits of our bodies and physical interaction within given environments. Anna Nazzari has been a practicing artist for over ten years. Nazzari’s practice centres on the investigation of mythological tales, superstitions and supernatural histories and events that emphasise moral certainty and foster a reading of the absurd. Dark Water has been supported by the Australia Council for the Arts and the Department of Local Government, Sport and Cultural Industries in Western Australia. Newer Post USA brewing talent hits Melbourne for Good Beer Week May 10 – 19, 2019	Older Post Get ready for the Turning the Tables Auction this Thursday April 18!